A few days ago, me and Ashlea took a weeknight ride into Derby to visit The Distillery. From the name, you'd assume that this is purely a snazzy bar - However, they do some pretty good food here too. Located in the Cathedral Quarter on Friar Gate, this quirky looking building certainly catches your eye. I really loved the alternative look and the vibe you get upon arrival. I also thought that the upper floor terrace was an excellent addition and would be perfect for a summers day. When you enter, it feels really warm and welcoming. The draping fairy lights overhead are a simple yet effective touch. We headed to the bar and ordered some drinks. A Dancing Duck 'Ay Up' for Ashlea and a mocktail for me. I asked to see the mocktail list but was told they don't have one (likewise for cocktails) as they like to create unique drinks for each individual. I told the bartender that I liked passion fruit and mango but didn't like mint. We were told to head upstairs which is where they serve food and were to a quiet table in the corner. We were given menus and it wasn't long before I was supplied with my mocktail. I really enjoyed the drink and it looked really cute. It was really fruity and full of flavour. I'd have liked it to be little bigger as it was gone within two sips and at £4 it was quite pricey to say it has not alcoholic content. The majority of the short but sweet menu is made up of burgers along with some other dishes such as Guinness Stew or Fish & Chips. We decided to go for a Bread & Oils to share for a light starter. There were three different breads along with a balsamic dip. The bread is served warm which is so much nicer to me. Although it looks small, it was more than enough for us both. For mains, I chose to have the Raspberry Glazed Chicken Burger. Yes it's a burger but with it being Chicken, it's something a little different. As it's topped with Goats Cheese, it's an automatic winner for me. You can taste the Raspberry glazing but it isn't too powerful so isn't one to 'make your tabs laugh' - If you're from Derbyshire you'll know what I'm on about. I wasn't too keen on the pepper mayo that lined the bun. It was far too strong and I ended up not eating the side it was spread on. There's a side of fries which were pretty standard and some strange looking battered circles. It turns out, these are Zucchini fritters and tasted great. I wasn't expecting to like them, but they were a nice addition to the plate and added something different. 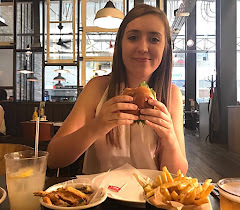 Ashlea chose to have The Homemade Distillery Burger with an added topping of JD Chilli Brisket. He really enjoyed this burger and told me that the brisket topping made all the difference. I tried a little and it falls apart and melts in the mouth. As our mains were cleared, we were asked if we'd like dessert. I wasn't overly fussed but we had a look anyway. I was a little disappointed not to see a dessert I would have eaten, so we just asked for the bill. Throughout our visit, all of the staff were super friendly and helpful. Just before leaving, I chatted with the manager which was nice to end the evening with. I would definitely come to The Distillery again. I think it's a lovely place to go for a nice quiet drink in beautiful surroundings and even grab a bite to eat if you get peckish. This is my kind of bar and that means something coming from a teetotaller like me. Thanks for a great evening Distillery Team.